Power Grid Company of Bangladesh Job Circular 2019. PGCB Job Circular 2019 & PGCB Exam Result 2019. www.pgcb.org.bd Online Application Form, Admit Card, Written Viva Question Solve 2019. Bangladesh Power Grid Company Limited (PGCB) Job Result, Exam Date and Seat Plan 2020 published on some Newspaper, PGCB official website and our website ReadingBD.com. Download Power Grid Company of Bangladesh Limited to apply. 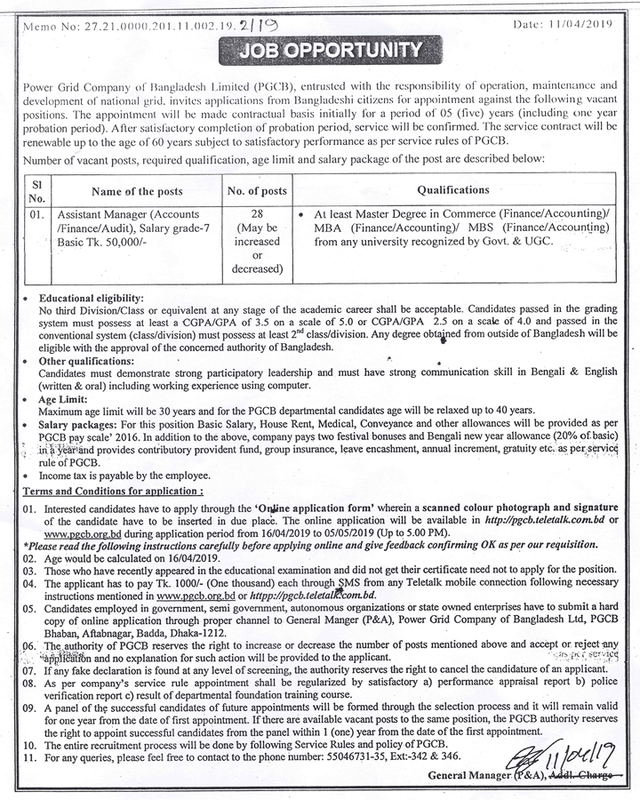 PGCB Job Circular will available on our website. Good news is, recently the Power Grid Company of Bangladesh Ltd. (PGCB) wanting New Job holder against empty vacancy. However, if you are interested to do government job, we predict Power Grid Company of Bangladesh Ltd. (PGCB) Jobs 2019 is a sweet one. Thus interested candidate checkout all of the essential data like application procedure etc. Power Grid Company of Bangladesh is the sole electric power transmission organization in Bangladesh. It is a government company that owns and operates the power grid in Bangladesh. It is a subsidiary of Power Development Board. Power Grid Company of Bangladesh Limited (PGCB), entrusted with the responsibility of operation, maintenance and development of national grid, invites applications from Bangladeshi citizen for appointment against the following vacant positions. Any third Division/Class or equivalent at any stage of the academic career shall not be acceptable. Candidates passed in the grading system must possess at least a CGPA/GPA 3.5 on a scale of 5.0 or a CGPA/GPA 2.5 on a scale of 4.0 and passed in the conventional system (class/division) must possess at least 2. class/division. Any degree obtained from outside of Bangladesh will be eligible with the approval of the concerned authority of Bangladesh. Candidates must have demonstrated strong participatory leadership and strong communication skill in Bengali & English (written & oral) for the position. Must have including computer literacy. Income tax is payable by the employee. Go to the http://pgcb.teletalk.com.bd . Select your Posts Name and Click to Next. Fill Up the Application Form Appropriately. Applicant’s need to upload JPEG/JPG system recent photo 300×300 pixel size where file size, not more than 100 KB and candidate’s signature 300×80 pixel size where file size not more than 60 KB. Successful submission shows applicants an applicant’s copy with the information provided by applicants USER ID. The ID is needed to keep for the next step to deposit fee or pay the application fee. The candidates can print the preview of applicants application copy. Reply SMS: Congratulation candidates addressing Name allotting a PIN informing the amount of fee to deposit for PGCB application program for recruitment. Example: PGCB YES 23529232 Send to 16222. Reply SMS: Confirms candidate of fee submission and allow a USER ID & PASSWORD unique to every applicant. After all procedure, they will declare the exam result. So keep on your eyes on our website to get all update information about PGCB Written Exam Result 2019, PGCB Viva Result 2019. Download PGCB Exam Result 2019. If you get more update about Power Grid Company of Bangladesh Job Circular 2019. Please like our Facebook Fan Page and get Updates.